Norment's racist views, in contrast, apparently haven't changed at all. 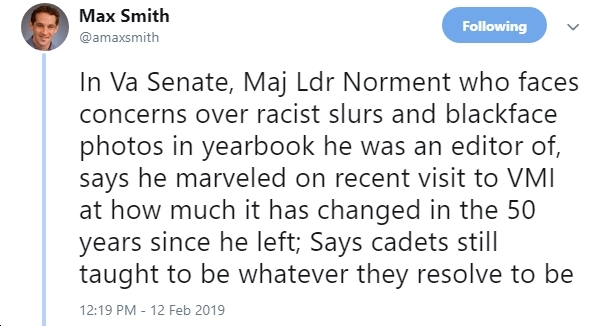 In this morning’s State Senate session, Majority Leader Tommy Norment (R) – who while at VMI edited a yearbook “filled with racist photos and slurs” – welcomed VMI cadets and – as reporter Max Smith puts it, “marveled on recent visit to VMI at how much it has changed in the 50 years since he left.” What Norment doesn’t mention, of course, is how little *he* has changed, or at least how little his racist attitudes have changed, in the 50 years since he left VMI. Zero self-awareness, clearly. By the way, Norment’s speech reminds me of the astonishing degree to which politicians can psychologically “compartmentalize,” not to mention their seemingly infinite ability to rationalize cognitive dissonance, delude themselves, etc. Tommy Norment certainly is a prime example of all that…plus one of the smarmiest politicians you’ll ever have the displeasure of listening to. Blech. With that, see below for video of Norment, and also for Max Smith’s tweet on Norment’s speech.